Today, many of us carry water bottles with us, but at the turn of the 20th century, there were no such luxuries. Most government buildings and train stations had a pump or faucet where people could get a drink. This was before the days of drinking fountains, so getting a drink was a tricky thing. A tin cup (often tied to the pump by a string) was available for people to share. Ick!! Imagine the germs. That’s just what Hugh Moore, a Harvard dropout from Kansas, did. He realized that the shared cups were spreading disease. He had an idea for a water cooler that came with paper cups. In 1908, he established the American Water Supply Company of New England with Lawrence Luellen. The two developed the Public Cup Vendor Company in 1909. The company grew slowly at first. Managers of train stations and government buildings weren’t interested in spending money on paper cups – something that brought no profit. In 1909, the Kansas State Health Officer, in an effort to prevent the spread of disease, banned all shared cups at train stations and public buildings. Moore was quick to offer his product as a solution. After that, other states began adopting similar laws and Moore’s company grew quickly. The company’s name changed several times. In 1910, it was changed to the Drinking Cup Company; in 1912, it became the Health Kup. Finally, in 1919, the company was named Dixie Cup – the name it’s been known by ever since. In 1921, ice cream vendors began using the cups to sell ice cream. During World War II, hospitals, factory cafeterias, and the Red Cross began using the cups. After the war, the cups became available to use in homes. In 1982, this long-lived company was purchased by the James River Corporation. Question: Why aren’t disposable cups used in public buildings today? 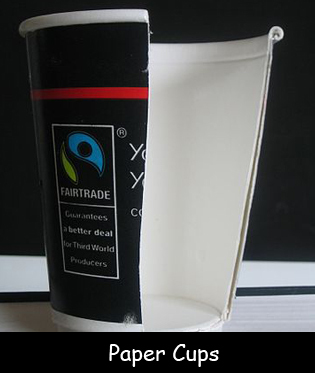 Answer: Disposable cups are considered wasteful and environmentally unfriendly today. They were replaced by drinking fountains. Find out who invented the drinking fountain.